“I’m magic, / I ain’t got no trouble. / Magic. / I ain’t got no fear,” she sings. 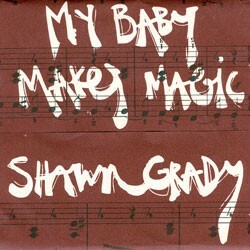 However, on the album’s title song, “magic” refers to the manipulation and deceit of a lover as she laments, “My baby makes magic / You know he makes me cry / He always plays his tricks on me.” Use of the same word to explore two disparate themes reveals one of Grady’s key talents: She can find timelessness and versatility in the common and familiar. Such a minimalist presentation only works with the right voice. Listen to a great Delta blues artist like Mississippi John Hurt — there is so much going on in his kind of vocal delivery. Beyond pitch and timbre, it contains a dense communion of emotion. Pain, trauma, angst and sadness are transcended by their own beauty. The exorcism of each bleak feeling stimulates healing and affirmation. Shawn Grady doesn’t just demonstrate an understanding of America’s most enduring song genre; she owns it. The album’s only cover, “Change Your Mind,” was composed by the great Blind Boy Fuller in the early 20th century, yet it seamlessly coexists with her original compositions. At just under 18 minutes, My Baby Makes Magic never wears out its welcome. Grady is an excellent songwriter and performer. Fans of vintage blues, singer-songwriters or melancholy folk should not hesitate to pick this one up. In fact, even if you think you don’t like that stuff, check it out anyway.